Enjoy the delicious crunch of brown rice with the sweet taste of honey and the warmth of mustard and peppers. Organic whole grain brown rice, organic rice flour (organic whole brown rice flour, organic rice flour), high oleic expeller-pressed safflower or sunflower oil, organic whole masa corn flour, organic sesame seeds, dried cane syrup, less than 2% of the following: salt, garlic powder, onion powder, mustard flour, spices (black pepper, white pepper, mustard), organic rice concentrate, tartaric acid, citric acid, turmeric, honey, natural mustard flavor, tarragon oil, and natural caramel color. Contains Sesame and Mustard. These were tasty and I would repurchase. Very flavourful and did the trick. However, how many were in the bag left a little to be desired. Excellent flavor and crunch. The sweet & spicy taste of honey & Dijon mustard really stands out. 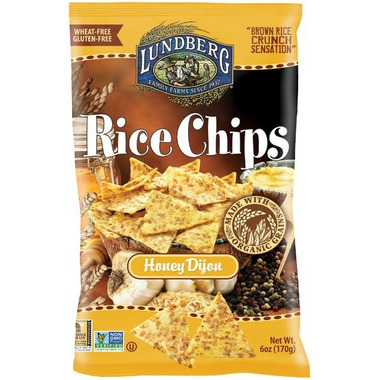 I love all the Lundberg rice chips. I can and often do eat all the bag in less than 2 days...thankfully the bags are not big! These chips are just a little bit TOO good! Hard to stop eating them until the bag is empty. Although the nutritional value is better potato chips, they are by no means a low calorie snack. These are crisp and tasty. If you like Dijon you won't be disappointed. Excellent; great flavour, very crisp! A favorite snack!